Although the Lynx is a nondescript, barely visible constellation, not visible from the Earth, it has very bright stars. Exactly 12 billion light years away from Earth region always form new stars. The lynx is found between the constellations "Big Bear" and the "Herdsman" in the northern star sky. It is an inconspicuous but rather big constellation. 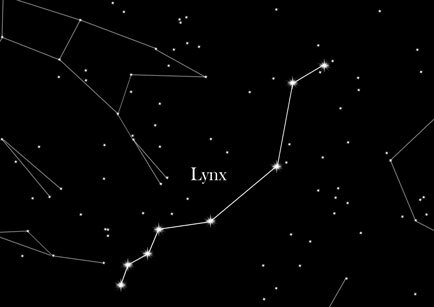 The Lynx constellation is like a chain of clear and faint stars in a sky area with very other few stars around. Especially you can see the Lynx in dark nights, which can be based on the primary star, at least the size is below magnitude 3. Since this constellation was not listed by Johannes Hevelius in the sky atlas until 1690, there is no Greek mythology about the Lynx. However, the name Lynx has to do with the fact that It is quite a dark constellation. Its firm boundaries gave it the name Lynx in 1930 by the "International Astronomical Union" (IAU).